Hello and welcome to our first monthly Cambridge Markets newsletter. Thank you to all our beautiful customers, stallholders and supporters for your wonderful ongoing support. You are everything to our business and we thank you for coming to our market in good weather and bad. Our newsletter will contain lots of information about what is happening at Cambridge Markets, our events and activations and feature articles about our stallholders. We hope you enjoy it! 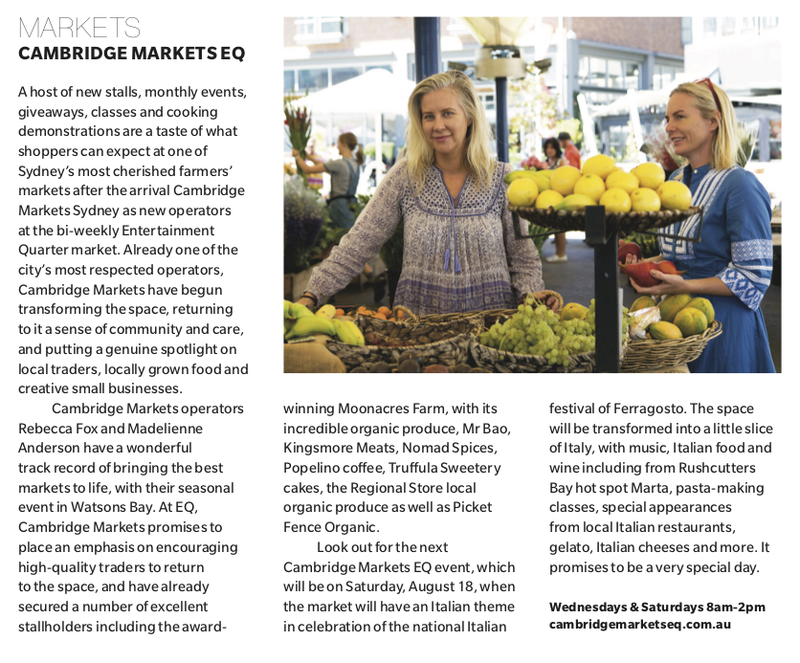 Firstly we want to share a recent article about Cambridge Markets taking over at EQ. We have been enormously excited to take the wheel in this incredible space, one of the oldest and best markets in Sydney. We have so many plans and proposals we are aiming to pursue over the coming months, so please stay tuned here to find out what we are up to. Thanks to our journalist friend Elizabeth Meryment for sharing the news of our arrival at EQ in her new magazine for the Eastern Suburbs, called Local. What a great article. If you see the magazine, please pick it up. Please join us on Saturday August 18 at Cambridge Markets EQ for our version of Ferragosto festival. This celebration of all things Italian will be a very special day for us all, when we have a red, white and green theme and a guest stall from hot local restaurant, Marta (see their gorgeous picture, left). We are big fans of this Rushcutters Bay Roman restaurant and its owners Flavio and Lucinda. The Marta team will be at the market doing a pasta-making demonstration of tonnarelli (long thick spaghetti), and a cooking demonstration of their dish of tonnarelli cozze e pecorino (mussel, cherry tomato, basil, pecorino). 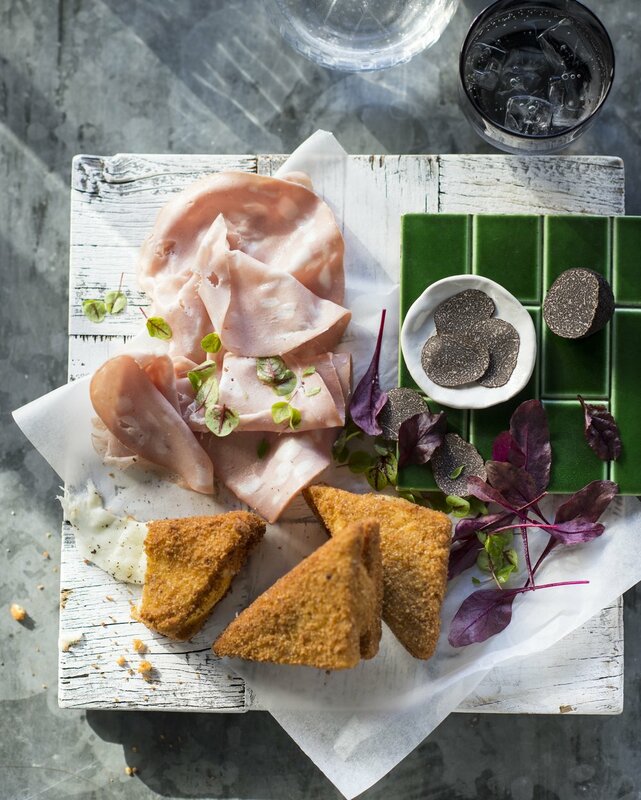 The team will will also offer two other excellent dishes for sale: gnocchi fritti (fried potato gnocchi, pecorino, black pepper) and polpette e polenta (veal meatballs, tomato ragout, soft polenta, pecorino). Delicious! As great lovers of Italian food, wine and culture we are very excited about this special day. This month we'd like to shine a light on our excellent stallholder, 2 duck trading. 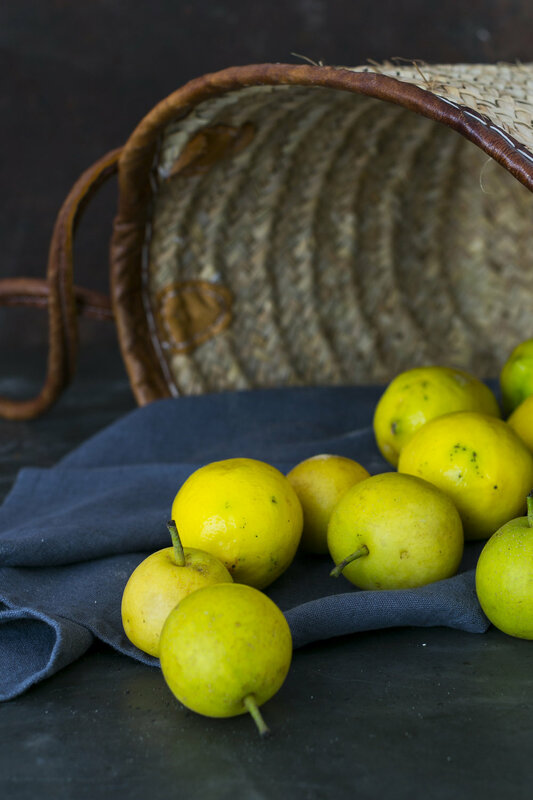 Lovers of all things French should seek out these specialist importers of the sorts of wonderful Gallic luxuries that make life worth living. 2 duck sells everything from handmade French linens and napkins to confit duck legs, duck rillettes, duck fat, goose fat, foie gras and cornichons, plus French-inspired baskets imported from Morocco, Breton t-shirts and more. Run by French-born Martine Baboin and her life and business partner Miriam Macpherson, 2 duck has been built over 11 years to offer “a link between France and Australia,” says Miriam. The business also offers French classes for all ages and abilities through Paddington’s frenchclass on Glenmore Rd. Join a class now to experience a slice of France in the Eastern Suburbs. We feel very glad to have the ladies at Cambridge Markets EQ. Their linen and baskets are featured in this gorgeous image by our photographer Parker Blain. Congratulations to our stallholder Moonacres Farm who were this winter awarded a Delicious Produce Award for their seasonal fresh vegetables. We love their veggies too! Read the story about the Delicious Awards here. Well done to the incredible team from Moonacres.